Three drawer wooden dresser. 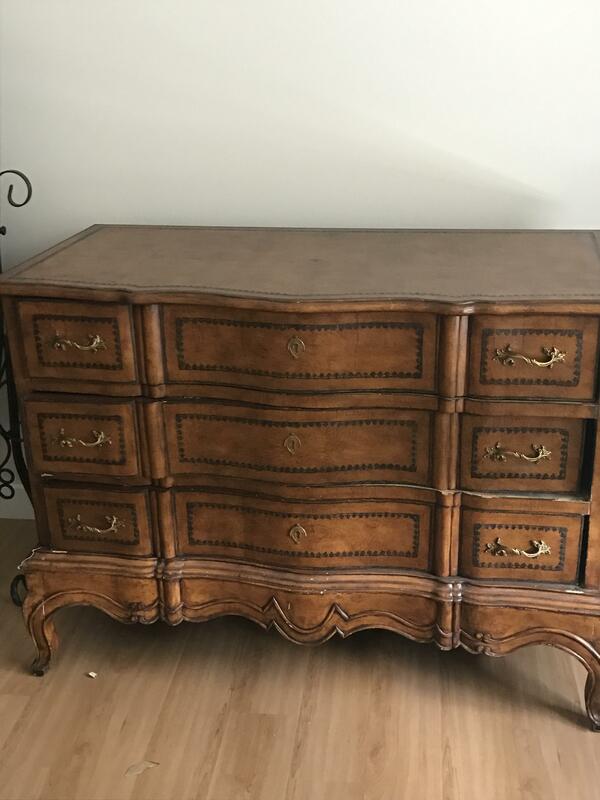 It has leather etchings on the drawers and leather etchings around the top,as well as a fleur de lis in the middle of them. Your piece is in the French Provincial style, which has gone through a number of revivals since its original inception in the mid 1700's, it seems to go through periods of popularity about every 30 years or so. The latest revivals date from the 1930's, 1950's and again in the 1990's, this one appears to date from the 1950's. Furniture in this style was made in both Europe and North America, the European exmples tending to be hiogher quality and closer in design to the originals. Currently the style is not in vogue and values for pieces like this remain modest, close to what your paid for it in the $500.00- $800.00 range.